Remember that time I had a beneficiary? This weekend, I was commissioned once again. Aaron had about 10 of his college friends in town for St. Patrick’s Day, and requested that I cook breakfast and dinner for them yesterday. Given that I obviously enjoy cooking and will do almost anything for extra money, I happily agreed. I showed up at 7AM and they were already awake, ready to eat, and cracking Bud Lights. I couldn’t believe they were up and ready to go after doing a case race the night before. Apparently grown men metabolize alcohol differently than a 23 year old female who drinks on a monthly basis. One of life’s mysteries. Aaron requested “Crab Benedict” for breakfast. I essentially used this crab cake recipe and this poached egg and hollandaise recipe, plus English muffins, bacon, and scallions for garnish. I wanted to take a picture of the completed product, but they didn’t exactly assemble the meal in a blogworthy fashion, and ate too fast for me to take pictures. Also, they convinced one of the guys that the girl showing up in the morning was going to be a stripper. Needless to say he was disappointed when I arrived in sweatpants, wielding a spatula. For dinner, I wanted to make something simple and delicious that would fill them up. I also wanted it to be somewhat fattening in order to satisfy a bunch of drunk happy boys. Just a warning, the quantities here are ridiculous. You would make 1/4 of this recipe on an average day. Finely dice the bell peppers, one of the jalapenos and the onion. I removed the seeds and ribs from the jalapeno, but if you want it extra spicy you can leave them in. Mince the largest clove of garlic ever. Saute the vegetables in a little bit of olive oil for about 4-5 minutes. Add the garlic and cook for an additional minute. Drain any extra liquid and allow the vegetables to cool. Combine the cooled vegetables and fajita seasoning with the meat until just combined. Allow the meat to rest for at least an hour, then form into patties. 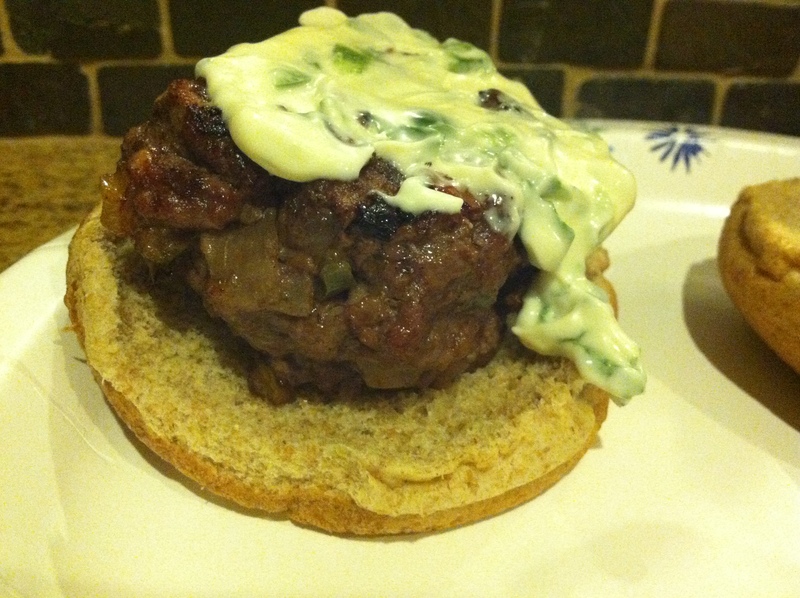 Mix the mayonnaise with chopped cilantro and the other chopped jalapeno. Top the burgers with the mayo, and serve. Best compliment I’ve received in a while. Thanks boys! Love the sound of these burgers! Huge cilantro fan (kind of a wimp with jalapenos, so I’ll be careful on those 😉 ) And thanks for the seasoning shout out! Glad you enjoyed the recipe.